Chris Quintero is an associate at Bolt, a seed-stage fund that invests capital, staff, prototyping facilities and expertise in startups at the intersection of hardware and software. We’re still in the early days of the hardware renaissance. 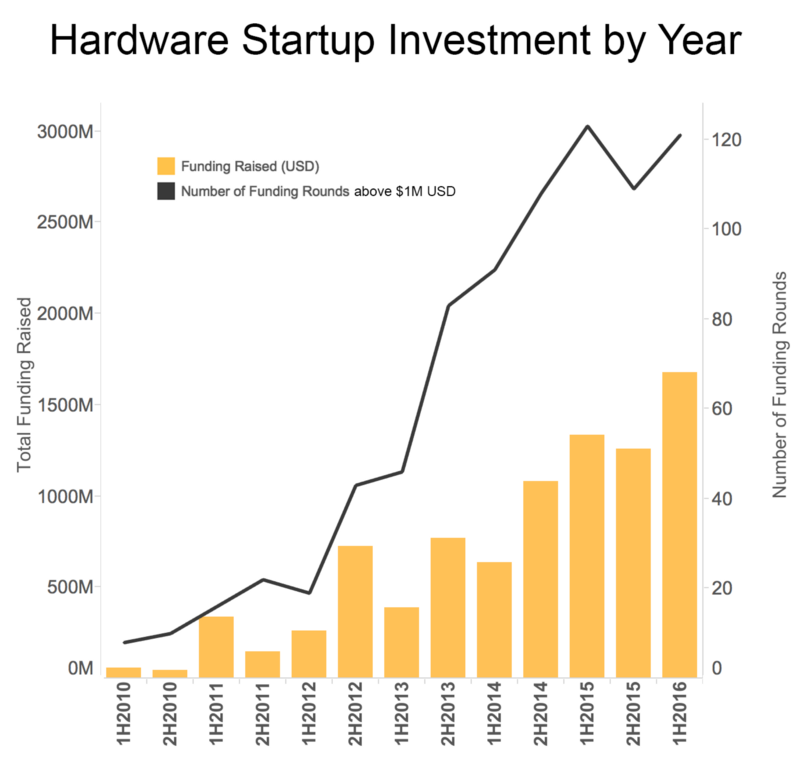 Driven by decreased development costs, shorter times to market and a shift in hardware business models away from commoditized consumer electronics to recurring revenue and software services, VCs have poured money into hardware startups. Last year we published an overview of this explosion in funding. Investment was up more than 30x versus four years prior. What has happened since then? Is the sector living up to the hype? Here’s what we found. Contrary to the broader slowdown in venture funding, hardware companies continue to raise cash. In the first half of 2016 we saw $1.7 billion invested across 120 deals — more dollars raised than any other six-month period in a decade. However, while dollars raised was up, the number of deals was flat (120 versus 123 for the same period a year earlier). This suggests to me that growth is leveling off as the category matures, investors get smarter about initial bets and we learn who can execute. 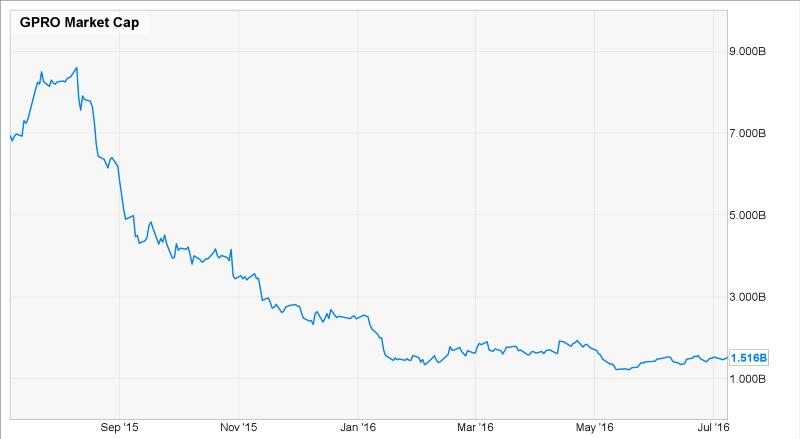 The darlings of the hardware industry a year ago, GoPro and Fitbit have struggled to maintain growth and are now both at roughly one-quarter of their peak market caps. Interestingly, their struggles are not because they’ve been commoditized by competitors — they’ve primarily struggled with saturation of their respective markets. If I already have a GoPro or Fitbit, there’s little incentive for me to buy the latest and greatest model. It will be interesting to see if either has success with new product lines in the coming year. In the last year we saw a number of exits, including Square, Misfit, Withings, Whistle and Jaybird. There aren’t as many multi-billion dollar success stories as 2014, but it’s good to see exits in the space. While Boston and New York City’s communities have grown significantly, San Francisco now outpaces Boston/NYC combined by almost 2 to 1. The number of hardware startups in the Bay Area (that have publicly raised $1 million-plus) currently sits at 161 by my count, up from 110 last year. 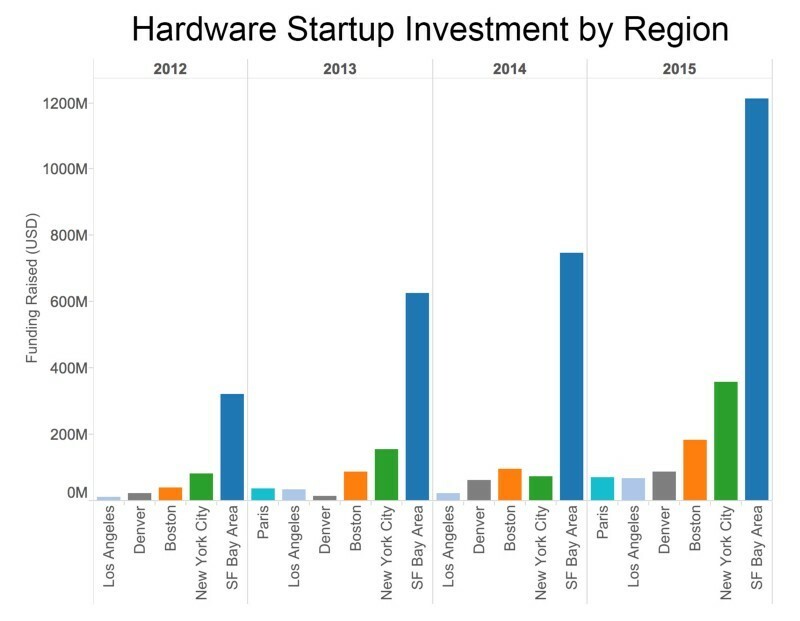 NYC has also recently overtaken Boston both in dollars raised and number of funded hardware startups. In the last year, Eclipse closed their first $125 million fund and is reportedly already out raising another. Hardware Club, based in Paris, is also closing on a fund of their own. It’s a bit premature to say which venture firms have been the most successful investing in the sector. 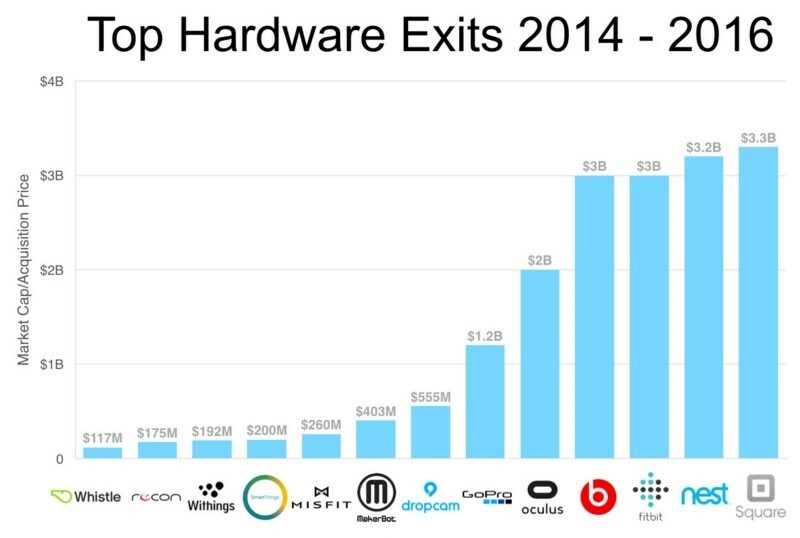 The biggest exits to date (Fitbit, Square and Nest) were all founded prior to 2011, when the hardware investing trend really kicked off. To be clear, venture funds have seen some great returns already (SoftTech and True with Fitbit, Kleiner and Shasta with Nest and Khosla with Square), but the vast majority of venture-funded hardware startups are only 2-4 years old. If the past few years have been about hype, the next few will be about execution. A venture firm’s number of hardware investments isn’t necessarily indicative of their focus on the sector. For example, a16z has done 50 percent more hardware deals than Lux Capital. However, we’d classify less than 8 percent of a16z’s portfolio as “hardware,” but more than 25 percent of Lux Capital’s deals as such. Investment in hardware has been strong over the last 18 months, but the rate of investment growth is leveling off as the sector matures. Many of 2013’s and 2014’s most hyped products are finally shipping; while it’s too early to tell for most companies, we’ve seen a few breakout winners (Eero) and losers (Skully) emerge. If the past few years have been about hype, the next few will be about execution. With the proliferation of new funds and accelerators, raising early money for hardware companies may be easier than ever. Raising follow-on rounds to scale is still the valley of death. Everyone’s definition of hardware is a bit different. By “hardware” I’m generally referring to connected device startups that focus on both hardware and software. Robotics, wearables and IoT companies fit this definition. Most consumer goods companies do not. We think of consumer goods companies like Casper, Warby Parker or Bonobos less as hardware companies and more as digital commerce brands innovating around distribution.